Baseball Power Hitting may be achieved by two different methods one is natural genes related and the other is developed with training and practice. Both the natural and the developed skills when combined with diligent practice habits will show and be subject to continued hitting improvement. The young player you see here in the picture is the "Mick" Mickey Mantle with that classic follow through of bat speed and wrist-snap. Learn well this baseball terminology surrounding bat speed know precisely how to generate bat speed and know the mechanics and the physics of this explosive interaction of bat and ball. 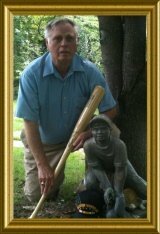 We shall see you in the future Baseball Hall Of Fame along with our other baseball hitting greats like The Mick. Everybody and every Body comes naturally with separate and unique sets of in house genes. Some people are tall some short some blue eyes and some brown eyes some with superb smooth body movements some herky jerky some with muscle and bone strength some not so strong. Jeff Bagwell as a Major League baseball player known most of his playing days at the Major League level for hitting the long ball had this to say about baseball power hitting. Jeff said: “You have to think power to have power. You have to train for power to have power. You practice power to have power. I built my body up but I also had to build my mind up. I had to re-learn how to swing with maximum effort. Probably the most important thing Jeff really learned was the secret hidden in these two words Circular and Torque giving him the bat speed and wrist snap capability for Power Hitting he was so desperately wanting. I dare not discuss the above two words and how they relate to becoming a great hitter with you at this time but Contact Us and I will gladly provide not only the answer but the Why? Therefore by nature and the law of averages explains the rationale of why some athletes and in particular baseball players have certain and differing athletic abilities. Hitting power which comes naturally via the genes attribute does not translate directly into an individual being a great baseball hitter or to be super as at baseball power hitting. It does, however, given proper training give those individuals a whale of an advantage from the get go to becoming a power hitter player for his team. 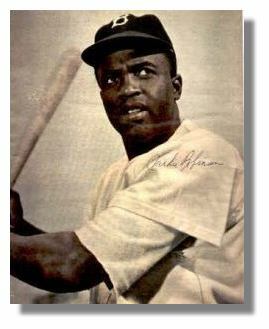 Assume for a moment a player was not blessed, with power contributing genes, such genes with the particular body physique or elements which makes up the essentials for swinging a bat with significant bat speed for power. Do not fret good buddy for with practice and training you as many others will achieve and master the baseball power hitting capability. First things first so let us identify the five essential elements from which real hitting power is derived. Understanding all of the above essential elements and the ways and means to improve and put all of them together is the formula we need for hitting power. Here is the myth so wrongly assumed by the mediocre or average baseball player trying to hit a baseball for power. Follow me now as I try to explain that how many batters, with myself included in this group, was so wrong about baseball power hitting. The batter thinks if he is strong enough and if he gets his bat behind the ball just right he can push it over the fence. A baseball will not and cannot be pushed over the fence no matter how hard you want to lift that little apple over the fence. The ball heads to the fence only by the the swinging bat speed meeting the ball with terrific bat speed a little timely boost from the other factors described herein which are the other essentials for baseball power hitting. So you really enjoy the competition of the sport of baseball and you want to make the team. Hitting is the name of the game and hitting power is what brings cheers echoing through the stands. Do not dismiss any of the physical movement and body strength used while hitting but the development of the five items mentioned are the key essentials which generates the power ability. The shoulders, the hips and the legs will add to the capability but without the five essentials the others become moot for hitting power. Take to heart practice and exercise the development of these elements and you will be well pleased at how little baseball flies from your bat like it is on a mission. Bat Speed: Folks do not make me explain all the physics involved with this action reaction and objects in motion elasticity of materials and such. Talk with any proven baseball hitter and he will concur the secret to hitting power or the stroking of the long ball is the magic of bat speed. Swing your bat lazy or swing it with gusto there is a difference and when you realize that this difference is what makes the baseball jump off the bat because of bat speed and head out like a screaming banshee then you know. Hey sport! 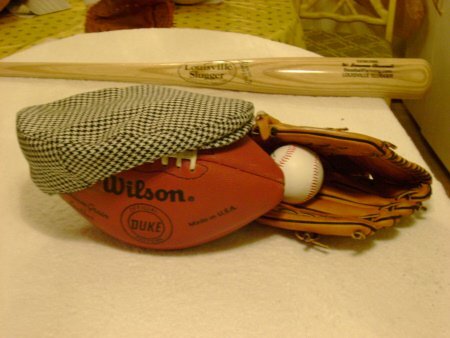 pretend in your mind that you have to swat that flying baseball before it escapes. Just do it with the vengeance of a commando or shining knight weilding his sword like lightening flashes. Bat Grip Strength: A powerful grip can allow you to overcome many shortfalls in most of your athletic endeavors. Here in baseball how can you possibly have bat control to even hit the baseball if your grip is not strong enough to dominantly control the attitude or placement of the bat during your swing? The answer is basic you cannot. Go to your friendly sporting goods place get a small grip exerciser ball or dough nut do the squeezing till that grip becomes like a virtual vice. Your growth into becoming that dreamed of power hitter demands you do the due deligence to make it happen. You need to live with this grip exerciser keep it in your pocket and several time during the day use it to build a grip strong enough to grab a freight train hold it in place and make it spin its wheels before you let go. Wrist Snap: That last little tweak of the bat control action precisely as the bat and ball meet, which we will call wrist snap, is the difference of clearing the fence or Ken Griffey Jr. grabbing it at the top of the fence. The biggest thing it does is add meaning and purpose to this thing about rhythm and timing transforming the swing into a smooth as silk fluid motion instead of stodgy poking at a ball. Like kicking in the afterburners of a jet aircraft during it takeoff climb this last second power boost makes little baseball jump high and long into the skies of the outfield. If the blast was a level swing then the outfielder best get on his hoss for that ball will scream well past his out stretched glove. Powerful Flexed Forearm: The power in the flexed forearm is simply like the transmission of an automobile it makes the wheels spin when the engine or grip strength fires off. We now just about have our hot rod ready to out perform all players on the diamond for power. "Mickey Mantle here in this photo shot is the purest picture of Baseball Power Hitting young players plese see and note those extended or flexed forearms personifying explosive power hitting." The flexed forearm transmits in nano seconds all the body power from the sole of your feet through the legs the hips and upper body and little baseball feels the stinging blast. Our engine (bat grip strength) our spark plug (wrist snap) and now our transmission (powerful flexed forearm) stand by for we are going to do some damage with baseball power hitting. Here is where and how we develop the flexible powerful forearms. Hang a 1 1/2 or 2 inch diameter sisal rope from one of the high tree limbs of that huge oak tree in your yard or neighborhood. Every evening coming home from school or the practice field do two hand over hand climbs up and down this rope strength building machine. Guaranteed by next baseball season your forearms will do the job of bat control and powered transmission lift and blast of little baseball well into the blue and over the green fence. Rhythm and Timing: Be a total klutch if you choose or spend some time training your body to be more flexible and rhythmic in its movement. Body movement and timing is one of the real ingredients you must achieve in your quest of becoming a baseball power hitting hero. Rhythm and timing are almost the same meaning as a matter of fact they are close kin or cousins to each other. Again we should note for some a body movement with control and having a sense of rhythm and timing is a natural thing for other it must be developed by practice. But coach how in the world does one practice this rhythm and timing thing? First and foremost quit being shy, "would you think a baseball power hitting star should be bashful?" Dale Carnegie one of the greatest motivational teachers of all time used this theme during his training courses "quit being shy or bashful stretch and expand your boundaries to achieve." Now it is your turn go ask that girl to teach you how to dance. Stretch not only your body but stretch your mind break the old habit of being self conscious if you do not display ease of graceful rhythm and timing in your athletic moves you will not develop baseball power hitting. The best cure and ease for developing body rhythm and timing is to introduce yourself to the girl in the neighborhood. Find a pretty soft ankle girl and ask her to teach you how to dance. Dancing teaches rhythm and timing of body movement which will do wonders or shall we call it a miracle to happen at home plate in the batters box. You have if you followed along in sequence learning my take on baseball hitting you were told one of first elements of hitting was Eye-Hand Coordination with Focused Concentration. Well good buddy I am a strong believer in the axiom if you are unable to put the bat squarely on little white baseball all is for naught. There still remains however for every player who has ever played this game we call baseball is the Forever Dream of being able to drive that pill over the fence or well beyond the racing outstretched glove of the outfielders. Baseball power hitting is the dream. The baseball power hitting dream can never be realized without understanding the need and value of magic and science of Bat Speed. Driving the long ball is bat speed dependent and the capability to bring the barrel and thus the sweet spot of the bat to the maximum moving speed during your swing of the bat is the key. Remember the speed of your bat swing the very nano second the bat meets the ball is the secret of baseball power hitting. Well ole shoe you do not have all the answers but you have a head start of knowing what is required to become a baseball player with baseball power hitting ability. Go Shopping Right Here And Now Save Money.